Hear ye, hear ye. The judges* have invoked a little known clause to the Ten Buck Tuesday rules, in which all Italian islands beginning with the letter "S" ending in "A" are granted a three-dollar exception (what with all the extra transport, marauding seagulls, duties, etc). 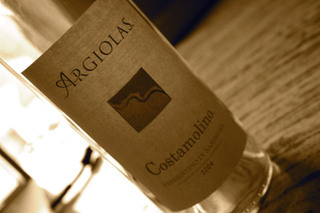 Thus, Argiolas' Vermentino di Sardegna Costamolino, is awarded this week's TBT title. Vermentino is one of Italy's most rugged white grapes. 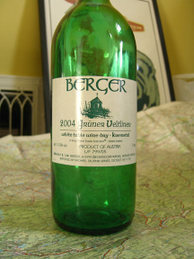 It can endure heat and drought, yet still produce wines with zip. This grape is a staple in the vineyards along Sardinia's coast. V-tino also seems to enjoy the Tuscan coast. This wine is sitr-fry friendly, peachy with salmon roulade, and superb with succulent scallops. Do you know of any budget island (Sicily, Corsica, New Zealand) wines that can compete with Argiolas' "big V"? When it comes to the $8-$12 sweet spot for wine of all kinds - red, white & bubbly; Spain reigns supreme. While my heart may be with value wine 'under dogs' like Portugal and Austria, I must give the Kingdom of Spain its due. However, I do have one minor gripe. Many of Spain's wine offerings seem to be of the modern, "kaboom fruit" variety. Still, many of these wines aren't necessarily off-putting. They are more or less easy-drinking, if not slightly generic, wines. Countries who attempt to throw down with Spain in the 'ten buck' department, are invariably forced to say to España, "No mas. No mas." One thing I have noticed of late is the gaggle of Garnacha (Grenache) flocking to the wine shop from nearly every Spanish Denomination with which I'm familar (and a few new to me). Take for example, Artazuri Tinto, part of Eric Solomon's seemingly endless supply of Spanish imports. This wine comes from the Navarra region - a neighbor to Rioja. I was expecting it to be the usual bargain-Grenache mix of berry jam scents along with a touch of pepper. Surprise! Artazuri has produced an outstanding character-full wine for ten bucks. This is one of the more unique expressions of Grenache that I've sampled in some time. I recommend sipping it slightly chilled. It would make a tasty pairing with a satisfying Stephencooks dish such as pork and porcini meatloaf. There you have it. Fine wine. Ten bucks. And nothing that could be confused with Hi-C or Hawaiian Punch. If you've recently discovered a tasty ten buck gem, share it with the class via the comments section. Our wallets thank you. I want to ask my wine amici to imagine themselves in their local wine shop..(cue harps and dreamy music)..
You check your wallet/purse/pocket/sock and discover all you've got is a ten dollar bill (or the equivalent thereof). 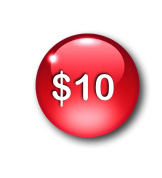 The question is: What wine will give you the most bang for your ten bucks? Tell us what you would pick - and remember you've only got ten dollars to spend. You can go under, but not over (imagine how embarrassing that would be at the checkout register). For extra bonus points, tell us what food pairings your $10-vino shines with. Once you've told the world about your ten buck wine gem, pass the question along to a fellow wine or food blogger. The aim here is to compile a big 'ol list of tasty, affordable wines for those days when we need a cheap gift, an accompaniment to Wednesday night's meatloaf, or we find a ten dollar bill in the front pocket of our favorite pair of jeans. I'll kick things off by tagging Terence Hughes of Mondosapore - a great resource for Italian wine. Terry, tell us, what's your ten buck wine gem? Let me also ask for a chef's opinion - Chef M! Got a ten-dollar wine recommendation? My contribution: Paul Cheneau Art Series Brut Cava, NV ($9). This little bubbly was only $8.95, which gives me about one dollar in change. I could create an instant party by purchasing a small bag of popcorn on the way home. Alternatively, Cheneau's Cava would greatly compliment my rediscovered joy of risotto. Continue reading to track this meme's blogosphere voyage..